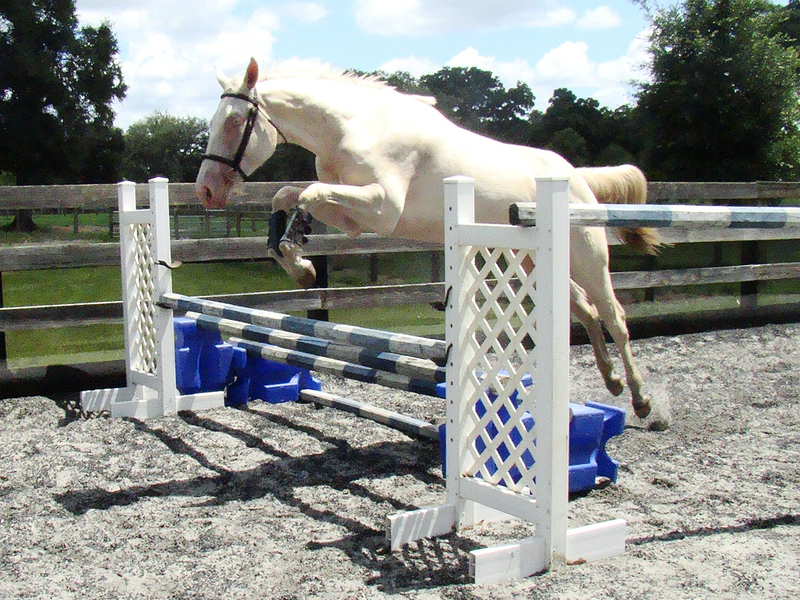 2008 German Warmblood Cremello SabinoFilly by Blue Eyed Dream GF out of Marigold. This filly is our first cremello sabino filly born, the first cremello warmblood filly born in the USA and the first born via embryo trasnfer. She has a very loving personality along with her sires charm. She a tall leggy girl with uphill build, a cute blaze and 3 socks. 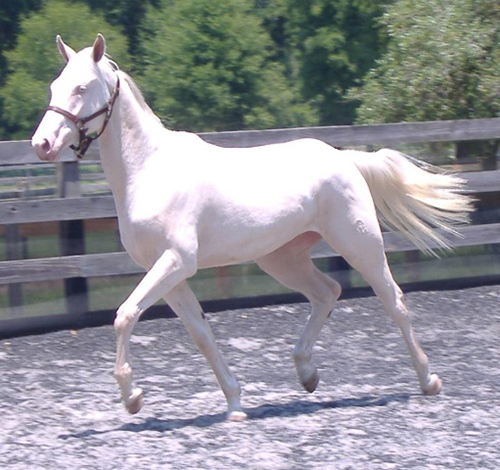 Moksha can be bred to any chestnut stallion in the world and will produce a palomino 100% of the time, when bred to bay stallion she will produce palomino or buckskin foals. She would be a great asset to any breeding program! Her dam Marigold is a First Premium Premier AWR mare and stands 16.3 and Marigold's sire Mascarpone was a very respected 16.3 hand cremello stallion in the breeding industry. Her sire is the top competing 16 hand cremello stallion in the USA (Blue Eyed Dream GF) and his sire is the 16.2 hand palomino stallion Blonder Hans. Blue Eyed Dream GF offspring have consitently grown-up to 16.2 hand,, we expect Moksha will be atleadt 16 hands.. Moksha is one of the last carriers of the Mascarpone line. Moksha was recently broke to long-line and accepts to bridle and surcingle like a pro! 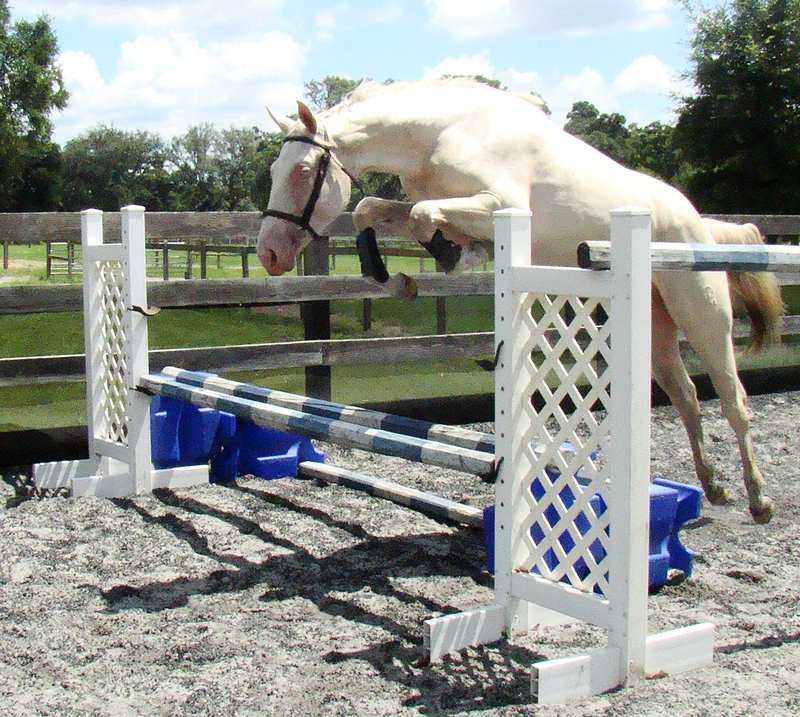 She is shown belowe free-jumping for the first time and shows excellent form and was very brave over the fences! 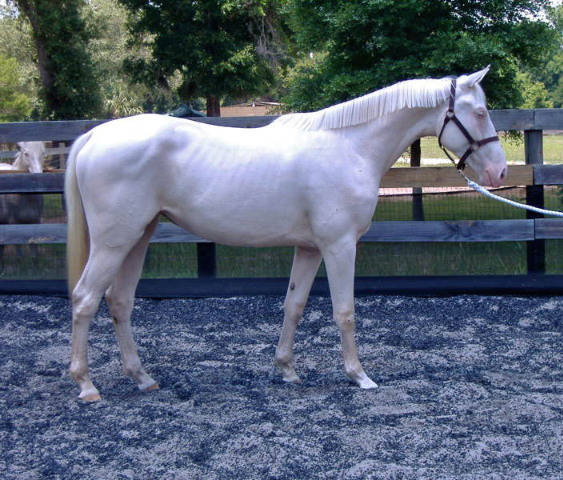 Don't miss a opportunity to own a rare cremello mare with excellent bloodlines, movement and tempermant! She is registered with the American Warmblood Registry, also eligible RPSI. Moksha was recently Featured in the Hunter & Sport Horse Magazine Article "Breeders News" (Jan./Feb. 2009)! Awarded First Premium with American Warmblood Registry with an overall score of 7.5 and 7.8 on conformation. Judges comments: good sporthorse filly, well developed hindquarters, shoulders good slope and enough length. Enough room in elbow, legs straight, correct walk, active, shows engagement from behind.